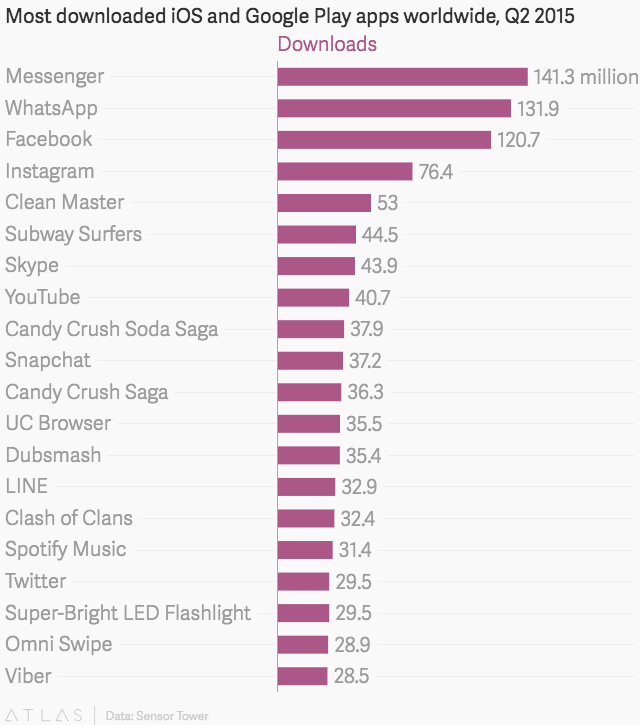 Facebook rules the app download charts. Four of the top five most downloaded smartphone apps worldwide for the second quarter of 2016 belong to Mark Zuckerberg’s company, according to new data from analytics firm Sensor Tower. 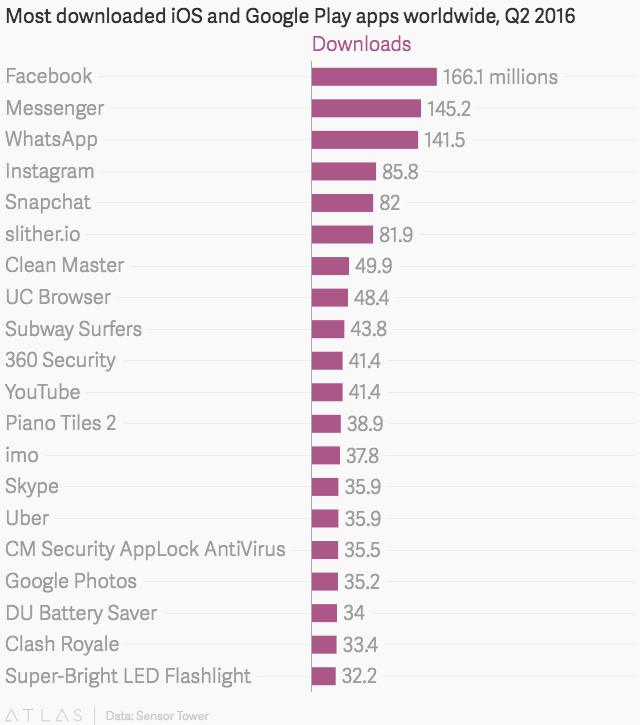 The sole non-Zuckerberg controlled app in the top five was Snapchat, which took fifth place. It was behind Facebook, Messenger, WhatsApp, and Instagram. The story was much the same a year earlier. The top five most downloaded apps in the second quarter of 2015 (pdf) also comprised four Facebook properties and one interloper. In that case, it was Cheetah Mobile’s Clean Master app, a utility for optimizing Android phones’ performance, in fifth place. Facebook’s dominance also speaks to the firm’s canny acquisitions strategy. WhatsApp and Instagram were purchased for what was then considered astronomical sums. WhatsApp was acquired for $21.8 billion in February 2014, while Instagram went for $1 billion in April 2012 (the actual price was closer to $715 million when the deal finally closed, due to depreciation in Facebook stock). Neither of those acquisitions is critical to Facebook’s bottom line. WhatsApp no longer generates any revenue, after dropping its $1 annual subscription fee in January. Instagram is on track to account for over 10% of Facebook’s revenue this year, according to Credit Suisse estimates; significant, but not essential. Both startups were integrated into Facebook for their user growth, particularly on mobile platforms, not their earnings. That strategy appears to have paid off.